Most cattle farmers or 4-H participants seeking a new calf will find themselves on a cattle lot or farm, looking over a potential new animal. 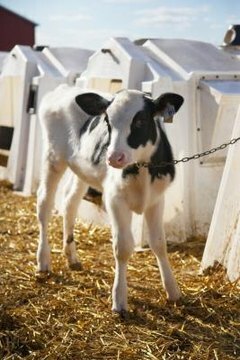 While one hopes the seller is honest about his livestock, it's best to go into a buying situation with some knowledge about calves. A calf's age is particularly important information, as it affects the animal's value—luckily, determining a young cow's age is a matter of the mouth. You've no doubt heard the phrase “Never look a gift horse in the mouth,” but when buying a calf, that's exactly where you should be looking. A calf's teeth will tell a prospective buyer or new owner a great deal about the cow's age. While dental inspection is a reliable way to determine ages up to 5 or 6 years, you're most likely to be looking at cows in the first two years of their lives. By the end of a calf's first month, he'll have eight temporary incisors: these are the cow's “baby teeth” and are smaller and whiter than permanent teeth. These temporary incisors will remain firmly in the mouth into the early months of a calf's second year. At around 17 months, the temporary incisors will grow loose and appear longer and narrower than they did in preceding months. The gaps between the calf's teeth will have increased in distance and the base of the incisors, at the gum line, will appear less white. The first permanent incisor (a central incisor—permanent incisors are easy to spot because they are larger, with a yellowish discoloration) will break through at around 19 to 20 months, usually erupting at an angle. The second central incisor will be present by the 21st month, and both teeth will be aligned by the time the cow is 2 years old. While dental age identification is a standard that beef farmers are encouraged to become proficient in, another method of age determination doesn't require a cattleman or -woman to pry open a bovine's maw. Simply check inside the right ear—some cows bear a numerical tattoo that indicates when the calf was weaned and given a brucellosis vaccination, an easy indicator of how old a a calf is.